Yesterday I wondered, “Where is the fear?” I guess it depends where you look! In that analysis I was looking at the options data and the fund flows in the leverage ETFs. Today we finally have some definitive signs that traders and investors are very concerned about further market declines. And it comes from sentiment surveys. From a contrarian point of view, this is a positive development because it increases the chances that the bull stampede that we saw yesterday was an inflection point. 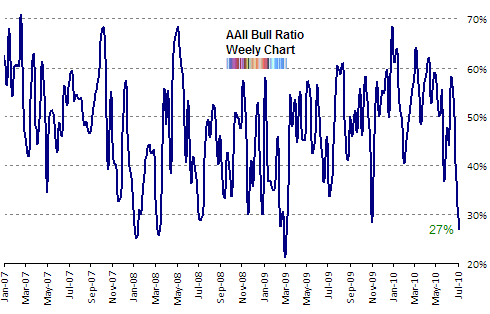 The bull ratio fell to 27% which is the lowest since March 2009. In fact, to find a more pessimistic sentiment from the AAII we have to cast back to March 5th 2009 when the bulls numbered only 19% and the bears a whopping 70%. It is also important to note that the survey was taken on Wednesday, when the respondents had presumably digested the 3% spike up in most major indexes. So people weren’t really swayed by Wednesday’s move or if they were, then pessimism would have come in much lower without that one strong positive day. As you can see in both charts above, there was an “Oops!” moment where for a few weeks both the retail and professional market timers thought that they had the all clear only to see the market go lower. The good news, from a contrarian perspective, is that once the market did break down, we saw a response of capitulation. If instead we had seen people petulantly insist on their bullish posture, that would have provided a huge warning for the market - even a crash warning. But we are finally seeing real fear. As a 25 year Registered Representative with a large book retirees and soon to be retired the phone calls I’ve received over the last three weeks are worse than what I received during the Lehman fiasco. I don’t understand where pundits get the idea that investors are complacent. They evidently aren’t answering the phone with actual stressed clients on the line thinking “Oh no not again”. They are disgusted by the “Flash Crash” and program trading. There you have it. More data and analysis tomorrow in the weekly sentiment overview! The voting at AAII.com goes for the full week prior to the published results, I believe. I just voted on AAII.com today and I believe that vote will count on next week’s results. Where’s the whoosh? I have not seen no stinking whoosh, like we did in march of 09. Your not suggesting that the past month and a half is a whoosh, are you? Take care. In truth I only voted to see if the voting takes place for the entire week prior to the results being released. But I voted “bearish”. Truth be told, I am probably a one-man contrary indicator!! Guys, we didn’t even retrace 1/3 of the move off the march 09 low. Could there be a fundamental sift in the way these indicators operate given our internet world? How are the questions posed? Here is what I can’t get right. Trading. I often read many web sites and get a good feeling for which site gets it right most of the time. Traders narrative is one of the top web sites for me. Here is what I did and lost some money on. I bought DXD on 6/23 for 28.33 and sold it out of fear for 27.77. Then the market went down on me and the shoulda, coulda, woulda got me again. Trading a market with this type of volatility is hard. Fundamentally the economy is stagnating. Technically the market is either a correction attitude or believes that the economy is slowing down. I have been watching the new highs/new lows and the advance/decline ratios. Volume I cant get a good handle on (C,BAC etc. volume) because I feel it is obscured in some way. Whether it is heavy, normal, new normal is cloudy. Up vs. down volume is easy to distinguish. I don’t have a good feeling re earnings season. Cuts have already been made and inventories used. It doesn’t look good to me, especially re future guidance. The world economy is decidedly moving slower and budget-cutting is the new normal (except here in the U.S. Where we think we can stimulate the world! Let’s face it! The only job growth here is the gov’t! According to survey to China Fund managers by Reuturs, the proportion of fund allocated to stock reachs to lowest level since March 09. It shows a tendency to be pessimistic in China market too. That’s quite interesting. Next week’s report should be interesting too, as after the massive rally we experienced, many of the shares have taken back half of their losses in just a couple of days. Please include inflow/outflow data into equity funds (especially Rydex). I think this information is much more important than mere surveys. This a trap. There’s bullish pessimism and and there’s the truly bearish pessimism we are witnessing right now. Remember from a technical standpoint you need a sentiment divergence before you can take a bearish reading as a bullish indicator. 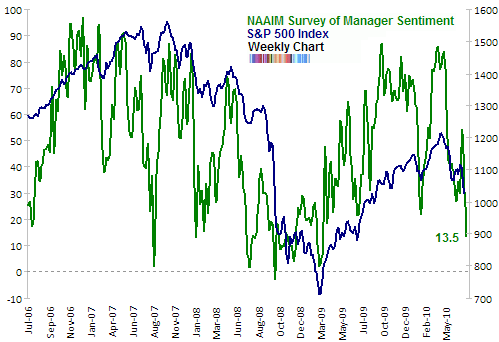 You need a positive divergence to sustain any move to the upside - look what happened with S&P500 vs NAAIM survey of manager sentiment between Sep-08 and Mar-09. Now as you can see both data sets are showing lower highs and lower lows in the sentiment reading. This is a CONFIRMATION of what is going on. Some would refer to this as the “slope of hope”… I believe we are in for a huge move downward, just because even after what we’ve seen over the last couple of months people continue to hang on to anything that, despite how irrelevant it is, can be spinned in a positive light. Also, the context is very important here: back in Mar-09 we were down more that 50% from the ‘07 peak and at least there was hope, but now we are up more than 60% from ‘09 trough and in the mean time, unemployment is way higher and there’s no hope in sight, consumer credit is contracting, and the rate of contraction is accelerating, M3 is contracting, not only that both PPI and CPI are showing the roots of deflation, but CPI is going down at a much accelerated pace than PPI = no pricing power at the end of the food chain, vacancies and lease rates at US shopping centers continued to get worse, office vacancy rate climbs to 17 year high, pending home sales index, based on contracts signed in May, fell to a record low 77.6, food stamps at all-time high, IL and CA are about to default on their debt …. and so on. By the way, do you remember 1987 and the concerns at the US budget deficit trajectory ? Now take a look at present-day USA. Do you need any more clues ?! A crash will come…unfortunately we don’t know when! these comments are making me more and more bullish.